Berlin loves its heroes. Especially those musicians, who have produced great songs and albums in the famous Hansa Studios in town. 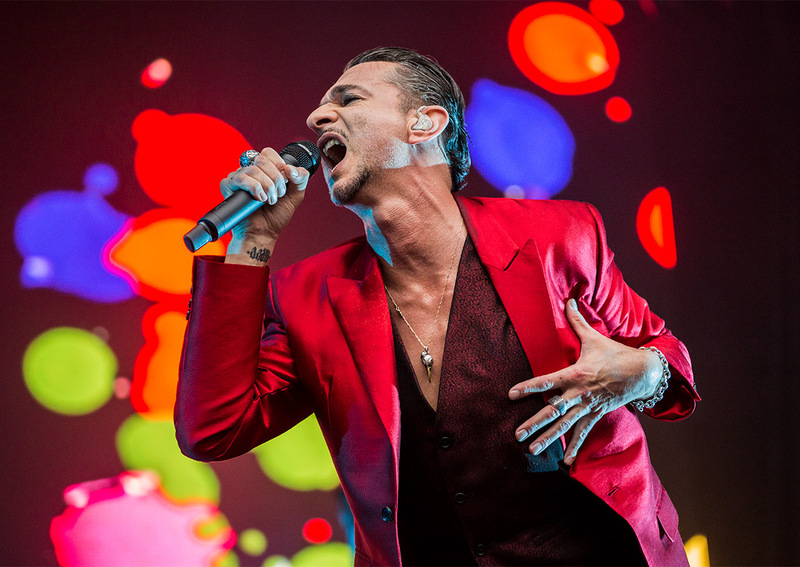 David Bowie, Iggy Pop, U2, and – of course – Depeche Mode. However, when the guys from Essex, England come to town, one gets the impression that the half the city is instantly dressed in black. It was the same again on Thursday, June 22. With the “Global Spirt Tour”, Depeche Mode filled the Olympic Stadium Berlin with more than 70,000 excited people. Moreover, the heaven was electrified too. From the second half, it supported the concert with an amazing lightshow. The flashes, partly in one-second intervals, were welcomed by the fans with thunderous applause. Luckily, nobody was hurt, but many were wet to the skin. The band started with their current successful single “Going Backwards”. With it, David Gahan, Martin Lee Gore, and Andrew Fletcher, took a step backwards in their history too. Such as in their breakthrough period in the end of the 80s and beginning of 90s, the song is a harsh blend of synthesizers, guitars, and heavy drums. Furthermore, the lyrics are critical of society as well as dark and pessimistic. A mix, that the fans love for 37 years. Once considered by critics as one-hit-wonder, Depeche Mode belongs to the list of the “50 Bands That Changed the World!”. They had up and downs and stand just before the end. All experiences are captured in their songs. A Depeche Mode gig isn’t just a concert, it’s more a family reunion. It’s a story of love, trust, loyalty, friendship. Many people, follow the band since the early years. It means, alsmost for 37 years now. With a big bang, or better with their synthesizers sounds, Depeche Mode revolutionized the music scene in the early 80s. Inspired by rock legends like David Bowie and Iggy Pop as well as visionaries of the electronic music like Kraftwerk, Tangerine Dream, and OMD, they created a brand-new music style. Their first album, Speak & Spell showed already a high standard, which the guys from Basildon never lost. From the beginning, Depeche Mode present a smart blend of trendy and danceable tracks as well as critical lyrics and dark melancholic moods. With the next albums Depeche Mode explored new horizons. Especially, when Alan Wilder joined the band in 1982, the sound became much more experimental. In 1983, Depeche Mode decided to follow the footsteps of David Bowie and Iggy Pop. They came to Berlin, to produce their songs in the legendary Hansa Studios. During that period, they were inspired by the spirit of Berlin as well as industrial bands like Einstürzende Neubauten. Hence, Alan and Martin began to play with various objects. Stones and scissors became a percussion, a voice or a hammer became a drum. So, Depeche Mode laid the foundation stone for a myriad of new music styles. Without bands like them, Techno, House, and many other styles wouldn’t probably exist today. From the beginning, the band created a cult in relation to their single releases. No matter whether a colorful vinyl, an impressing cover, or cool bonus tracks; each single was something special. Not seldom, the B-sides or non-album songs were as successful as the main tracks itself. Today, the guys talk quite neutral about their time in Berlin. Nevertheless, it cannot be denied that Berlin has influenced the band in many ways. Besides music, and in accordance with their name, Depeche Mode stands for a very special fashion style. Probably, inspired by the club and party people of Berlin, the guys presented themselves in new looks on their Construction Time Again Tour. From then, Dave, Alan, and Andrew appeared in rough black leather. In addition, Martin played with a blend of fetish and fashion elements. While, the media assumed stupid sexual matters, or a fascist attitude, the fans loved the new look. It remains in vogue for them until the present time. Depeche Mode have the most loyal fan base in Germany. Since the early 80s, the singles achieved top positions in the charts and the albums gold and platin status. In the mid-eighties, Depeche Mode experienced an international breakthrough. One of the highlights was certainly the concert in the Pasadena Rose Bowl Stadium, California, USA. More than 60,000 excited fans, celebrated the end of the Music for the Masses Tour on June 18, 1988. Depeche Mode belongs also to the less bands, which played concerts in the Eastern bloc. The band performed already in Poland and other countries in their early years. But in 1988, they played a concert in East-Berlin. This gig put the complete GDR in a state of turmoil. Because, the fan base was immense there. The endless tours, studio and TV sessions exacted their toll after 15 years. Disappointed, the creative sound designer and educated musician Alan Wilder left the band in 1995. He said: “Since joining in 1982, I have continually striven to give total energy, enthusiasm and commitment to the furthering of the group’s success and in spite of a consistent imbalance in the distribution of the workload, willingly offered this. Unfortunately, within the group, this level of input never received the respect and acknowledgement that it warrants.” (June 2, 1995, archived at the Wayback Machine February 4, 2014). After the exit of Alan Wilder, rumors about a complete split began to spread through the masses. They were fomented additional due to David Gahan’s drug abuse, Martin Gore’s alcoholism, and Andrew Fletcher’s depressions. The fans were prepared for the worst. Finally, with “Barrel of a Gun”, the trio, confirmed impressively their persistence. Probably, that period is one reason, why all Depeche Mode concerts are sold out since then. The fans know, that every gig could be the last one. So, in Berlin celebrated 70,000 fans their heroes this week. And Depeche Mode remember their own heroes. It was in 1980, when Vince Clark (a former band member, later famous with bands like Yazoo and Erasure) looked for a singer. He heard David Gahan’s voice at an audition of a local scout. Gahan performed a rendition of David Bowie’s song “Heroes”. So, Depeche Mode were born. Now, as a special encore, the band performs “Heroes” on stage, as a tribute to a great musician and idol of so many people. This performance, creates a very exciting as well as an emotional moment. In general, the 22 songs of the concert, are a trip through the time and history of Depeche Mode. Of course, the band performs their newest songs as well as their most successful ones. Those, who expect to hear very rare songs from the early years will be disappointed. This could be an important feature for future gigs. Depeche Mode will play on July 1, in Paris. They will perform in Spain, Russia, Ukraine, Poland, before they play 30 concerts in USA. Hereafter, the will come back to Europe and Germany.